Bike Repair: Here's When You Should Change Tyres And Brake Pads? Bike repair of Tyres and brake pads are components that together take a beating from the rough terrain, weather, debris, etc. They deliver their best when they are in optimum condition, providing the rider with better braking and control. Replacing tyres can prove to be a tricky job as it varies based on rider and the terrain one rides on. While at first glance your tyres may look ready to hit the road, a closer inspection may reveal the need for a replacement. The type of tyre, terrain, rider’s weight, handling and conditions where you park your bike, determine the health of your bicycle tyres. You might have observed that the back tyre is more prone to getting worn out as compared to the front tyre. It is a good routine to check your tyres regularly before and after every ride. Refrain from waiting for your tyres to weather away completely as it increases the chances of a mishap. Avoid parking your bicycle under direct sunlight or rain. Prolonged exposure to such elements can drastically reduce the strength and resistance of tyres by breaking down the rubber and shortening your tyres lifespan.Also, exposure to sunlight leads to UV degradation. It is advisable to keep your bicycle indoors in a dry place. You can keep your bicycle mounted or upside-down when storing it or not in use for a long period. Rainwater, extreme cold or heat is enough to cause your tyres to harden or make them crack. 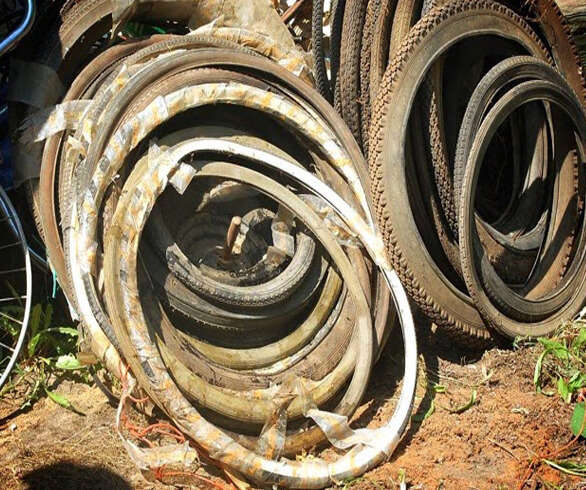 It is advised that you not throw away your old tyres as they can be used in case of an emergency. The same applies to your brake pads when they harden and tend to crack. You might not always be aware of the debris that fly off your wheels or get stuck in the rim embedding itself in the pads. Not only does it harm your rims, but worsens with every brake. It is a good practice to remove your wheels and wipe those brake pads at regular intervals, irrespective of the weather conditions you’re riding in. So examining your bike before and after every ride can always be handy. Follow the simple guidelines above and Bike repair tyres and brake pads will be as happy as you are after a good ride. So examining your bike before and after every ride can always be handy. Follow the simple guidelines above and Bike repair tyres and brake pads will be as happy as you are after a good ride. In this article:Bike Repair, Bike Repair: Here's When You Should Change Tyres And Brake Pads?